Model L40 is a low-cost, universal meter for 65 user-selectable analog input signal types and ranges. These include DC voltage and current, AC RMS voltage and current, process signals (4-20 mA, 0-10V), thermocouple (10 types, °C or °F), RTD (6 types, °C or °F), thermistors (NTC or PTC), resistance (0-5k or 0-50k ohms), and potentiometer inputs. The same meter handles all of these signal types with no need for a plug-in signal conditioner board. The meter's universal power supply accepts voltages from 18 to 265V, AC or DC, so that power can be 24 Vdc or AC power in any country. The meter conforms to the popular 1/8 DIN size standard and features four 14.2 mm (0.56") high red LED digits. The display is user scalable for input types other than temperature. The base L40, as shipped by Laurel, is set up so that a 400 Vac input reads 400. To change to another signal type or range, pry off the meter faceplate, push out the electronics, and place jumpers as illustrated in the manual. The jumper positions are well labeled, and the jumpers have a large, easy-to-grasp handle. Also make software selections using front panel keys. If you want Laurel or your distributor to set jumpers and do the front panel programming for you, order the FS option. Extensive software features add flexibility to this low cost meter. 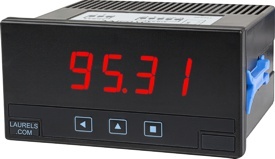 Programmable features include five levels of display brightness, min and max capture, dual scaling selectable by an external control input, a deadband around 0 for AC measurements, a moving average digital filter, a "count by" function, hysteresis for alarm operation, a user-configurable fast access menu, and selectable password protection. Further flexibility is provided by 1 or 2 optional output boards, which can be added at any time. An Option 1 board can plug into the display board. This can be a single 8A relay board, an isolated active or passive 4-20 mA analog output board, or an isolated Modbus compatible RS485 serial data output board. An Option 2 board can plug into the Option 1 board if installed. This is another single 8A relay board. For example, this board allows an L40 to have and analog output and a relay output, or to have two relay outputs. If only a single meter is to be stocked for a large number of applications, the low-cost L40 is your choice. While this meter does not match the high accuracy, speed and programmable features of our Laureate series, it is perfect for many panel meter applications. None. Meter shipped with factory default settings for 0-400 Vac input, display of 0-400. Slot 1 option Board. Shipped installed in meter. Slot 2 option Board. Shipped installed in meter. Requires Slot 1 option board.